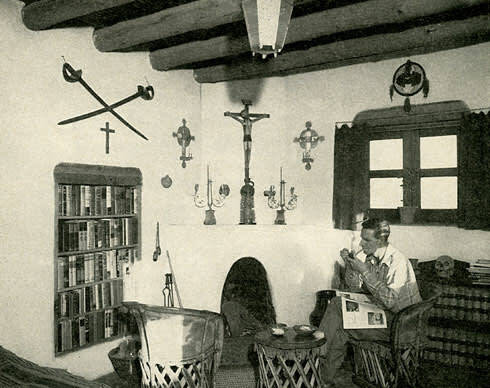 For 50 years, John L. Sinclair (1902–1993) wrote fond, in-depth reports on various New Mexico locales for this magazine. Raised in England and Scotland and eventually disinherited by his aristocratic family there, Sinclair landed in Clovis, New Mexico, by train in 1923. He spent the next 60-plus years in the Land of Enchantment working as a cowboy, museum curator, and writer. Read more about him in the January 2013 New Mexico Magazine feature “At Home at the End of the World” (bit.ly/JohnSinclair). In the spring of 1944 I went to Kuaua—Coronado State Monument— as a custodian, and to write a novel. I found there an unfettered, solitary life, a home—and also the full force of wind and the uninvited company of millions of ants. The ruins of ancient Kuaua Pueblo lie two and a half miles northwest of Bernalillo, on the west bank of the Río Grande. Harsh and barren though the setting may be, no spot could be lovelier for the view of the mountain river, and the broad panorama of sagebrush flats, with mesas looming along the western and northern skyline. No ground could be more appropriate for the remains of the ancient dwellings and the eternal resting place, which, until three-and-a-half centuries ago, gave human life to the area. East, beyond the valley, tower the Sandía Mountains—sacred to the Indians as the home of Wind Old Woman, mother of the Twin War Gods—with the summit ten thousand feet above the level of the sea. From the north comes the river, skirting the mesas to the west and irrigating the fields of Algodones, San Felipe, and Ranchitos. Westward stretch plains of sand, and sagebrush as far as the eye can see. Southward flows the Río Grande, coursing its way to Albuquerque, El Paso, and the Gulf. Coronado Monument, though not as spectacular as the Frijoles ruins in Bandelier National Monument, is nevertheless one of the most important archaeological landmarks on the Río Grande. There, on September 7, 1540, Hernando de Alvarado, captain adjutant to the great explorer, general, and would-be conqueror Francisco Vásquez Coronado, gazed upon the adobe-walled Pueblo of Tiguex [Tiwa], and the transition from archaeology into history took place. There, too, was written by a foot soldier of the Coronado Expedition, one Pedro de Castañeda, the first narrative of life on the Río Grande. Kuaua at the time was one of 12 villages that made up the Tiguex Province: Towns of Tiwa-speaking Indians that ranged from the present-day Pueblo of Isleta to one long gone to ruin in the vicinity of the Spanish-American settlement of Algodones. Today, only two of the Tiguex towns remain inhabited—Isleta and Sandia. There is no proof that Kuaua was the village chosen by Coronado for his headquarters from 1540 to 1542 as recorded in the Castañeda narrative, but there is also no proof that it wasn’t. The town must have offered the Spaniards an impressive sight as they marched upon it from the west. There, beside the great river with the Sandías looming to the sky behind it, was a massive dwelling built around two main plazas containing over 1,200 rooms on the ground floor alone, and in all probability it was more than one story in height. Six kivas were essential for the complex and endless rituals to the gods. Kuaua could have housed a population of about 1,500 people. When the ruins were excavated during the latter part of the last decade, over 600 skeletons were taken from their graves, and many more yet remain in the sand of Mother Earth. COURTESY PALACE OF THE GOVERNORS PHOTO ARCHIVES (NMHM/DCA) HP_2007_20_467. In March 1935, the commissioner of public lands for the state of New Mexico set aside the site to become the Coronado State Monument—“to be preserved for the use and pleasure of the people of New Mexico.” Excavation of the ruins had already started under the direction of Dr. Edgar Lee Hewett, then director of the Museum of New Mexico—a project supervised by students from the anthropology department, NYA youths [National Youth Administration, a New Deal program], and WPA workers. They swarmed over ancient Tiguex to dig her from desert covering. I arrived at Kuaua accompanied by my household furniture, which included a typewriter and reams of paper as well as 500 books, a dog, and three cats. I found solitude with a capital S, a vandalized museum, a house pretty much in a state of shambles—and to my chagrin that someone of little integrity during the interval between custodians had absconded with the bathroom fixtures, the hot-water heater, and the kitchen stove. The place could not boast the convenience of electricity, but being close to the pipeline, it enjoyed a plentiful supply of natural gas. The projected novel could wait, for there was plastering, plumbing, carpentering, and general repair work to be done. My dog and cats made themselves at home without delay. The desert climate is fickle. There are days when the wind is still and the sun bathes the monument, and even in the dead of winter, certain days permit one to walk about coatless, so pleasant is the warmth. There are nights when the moonlight turns the whole landscape to silver, and the river is a dark ribbon, and the dark mountains seem to stand out before the eye more prominently than they do in the light of day; and the sagebrush flats lie in silver to melt into a dark blue sky, and all is quiet and serene. Then there are winter days when the sleety blast sweeps over the ruins to lift the dry sand from its ground and pelt anything that stands in its way—wind of sharp, bone-chilling cold. There are summer days when the temperature rises to the height that extracts perspiration from the system and dampens the shirt and brow. Kuaua is a place of constant and sudden change—change in weather and the wide view—but the two old faithfuls ever remain to make themselves prominent: the wind and the ants. The wind will fill your eyes, ears, and nostrils with the finest of dust; the ants will seek the hospitality of your kitchen and, if you are not careful, season with themselves the makings of your dinner. When the repair work was completed I had a comfortable home at Kuaua. The house was of adobe, built in a way to be congenial with the remains of the old Pueblo. The living room had a corner fireplace and the floors were of flagstone, the dark vigas of the ceiling contrasted with the whitewashed walls. My furniture was from Old Mexico, my rugs Navajo, wall and door hangings mellowed old blankets from Chimayó. I made the bookcases myself and the walls were decorated with things of the tinsmith’s craft, brightly colored corn, Indian watercolors, and painted gourds. Here and there stood kachinas and santos; pottery and basketry were handy to trip over. The house was set within a walled, flagstone patio. There, time flew at a rapid pace, while silver maple, roses, poplar, rose of Sharon, spirea, and all manner of perennials were planted. The soil had been churned with the excavations and was not fertile; so to right the sad condition, wagonloads of fertilizer were hauled from the ranch of a generous cow-owning neighbor four miles away. With sunshine, warmth, and constant irrigation, the plants lived and bloomed. Mornings would bring from nearby Santa Ana Pueblo the Indians who helped with maintenance work on the monument. They arrived in a wagon or on horseback and consisted of four generations—from great-grandmother down to the toddler of 18 months. Great-grandmother scaled the ladders to plaster the walls of the high museum building, and when the toddlers fell asleep, they were carried to the couch in my living room. There was never a dull moment. In spite of all the activity, many visitors to the ruins from nottoo- distant neoned and concreted Albuquerque would look about at the desolation and ask me, “Don’t you get lonesome out here?” Lonesome! With the view of the desert, mountain, and river ever before my eyes! With Indian neighbors to entertain, and ancient ruins to keep up! With papooses on my living room couch! And a novel to write! Most visitors to Coronado Monument are pretty fine folks; the remainder make me wonder why they go there at all. Some spent hours, even a full day, wandering through the ruins, climbing down into the kiva, examining everything in the museum, and asking sensible questions. Others would leave the sanctity of their Fords or Chevrolets for a brief moment, ask me if I was married, how much my salary, and if I didn’t find the lack of city conveniences nervewracking. Then they’d turn toward the old gas wagon and drive away disappointed. One woman from Texas had an “excellent idea” to present: after looking over the museum, she decided the building would make a splendid roadhouse if the Spanish Colonial hall were converted into a dance floor with a jukebox, the Tiguex archaeology room made a bar serving choice liquors, and the ethnological room a dining place specializing in fried chicken with shoestring potatoes. Perhaps the most enthusiastic group to visit Coronado Monument were some fliers from Kirtland Field. They came out one Sunday afternoon and it was sundown before they finished exploring the ruins. Before they left, they asked if they couldn’t come out for a steak fry some night, and when I assented, they set a date. They came loaded with the steaks and other essentials, and the night they chose was the finest of the year—the night of the September full moon. With our minds more toward steak and not directed to the beauty of the night outside, we cooked the feast on the kitchen gas range. Upon finishing the meal, more guests arrived: a group of my Indian friends from Santa Ana, who often dropped in at any hour to talk or sing their tribal songs to the beat of the drums. The boys—one from California, another from Washington state, and a Brooklynite—were very much taken with the Indians. I left the gathering for the outside, piled some piñon wood on a heap where the view of the mountains and river were best, and set a fire. Then I collected the drums and called my guests outside. The night was gorgeous, the landscape silver in the moonlight, the sparks from the fire rising upward with the smoke, and the flames casting a glow on the adobe ruins. The drums throbbed and the Indian chant cut the silence—a deep silence with no other sound to penetrate it but the crackling of the fire. The boys were thrilled. Hardly a day passed but the Indians would come by for a visit. They would tie their horses to the hitching rack or park their wagons by the patio gate. There was always coffee for them, and they knew that they were welcome. Some even defied their bred-in superstitions to come to the ruins after sunset. “I heard the drums last night. We could even hear them over at the village,” said one, when he came to work one morning. Yet, it was not so strange. Often, when moonlight covered the ruins, I let the imagination go back to the days, centuries ago, when Kuaua was peopled. Then I could almost hear the chant and the beat of drums, and imagine painted and plumed figures climbing out of the kivas—and voices and the tread of moccasined feet, and laughter as one child chased the other through the plaza. But it was a dream. There was nothing alive anymore to the great spread of adobe walls—but plenty of dead under them. Nothing quick but the wind and the ants. Those who make a profession of antiquity claim Kuaua thrived as a town from about 1300 to sometime between 1600 and 1680 A.D. During that span of centuries, the people farmed and hunted, fought off enemies, and staged elaborate ceremonies for their own particular gods—gods who were nobody else’s business. In answer to their prayers, the Sky Father let loose his rains to fall on Earth Mother, who conceived and bore crops. The people bred their babies and buried their dead. Then they abandoned the town. It could have been a plague, fire, oppression from the Spanish or enemy Indian sources, drought, or maybe they just wanted to migrate and live somewhere else. Science can only guess at the cause of their leaving.